I have said it before, and I will say it again: I rarely make dessert recipes twice. There are just so many I want to try and so little time! However, there are certain recipes that are so tasty and receive such high praise, I just have to make them over and over. This week I will be showcasing two or three of those crowd pleasing recipes for you to read, review and make. Then you can just sit back, nibble a cookie and let your ego get enormous from all of the compliments you will receive! 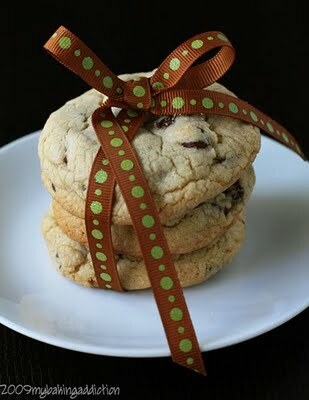 The first recipe I will share with you is from bettycrocker.com and is for Extraordinary Chocolate Chip Cookies. I do not fling the word “extraordinary” around on a regular basis, because in my opinion it can be a pretty lofty claim especially in regards to baked goods, but believe me when I say that these are indeed extraordinary. 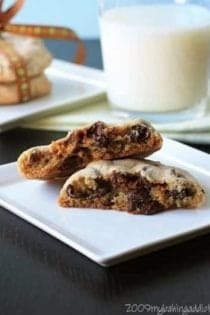 Now I know that chocolate chip cookies can be a very personal thing because of texture preferences, but these really seem to please the vast majority of chocolate chip cookie eating peeps. Well, except those weird people that are partial to flat, crispy cookies. You know who you are. Make these cookies once, and I guarantee you will make them again. Thanks for stopping by and have a fabulous day! 1. Heat oven to 350°F. In large bowl, beat butter, sugars, vanilla and eggs with electric mixer on medium speed or with spoon until light and fluffy. Stir in flour, baking soda and salt (dough will be stiff). Stir in chocolate chips. 2. On ungreased cookie sheet, drop dough by tablespoonfuls or #40 cookie/ice cream scoop 2 inches apart. Flatten slightly. 3. Bake 11 to 13 minutes or until light brown (centers will be soft). Cool 1 to 2 minutes; remove from cookie sheet to cooling rack.